The holidays have come and gone and it left behind a few extra pounds… on me. **Cue violins** Nonetheless, I’m determined to lose weight and get back in shape. It’s a promise and goal that I set every year-every month-and every day. In fact, I get asked quite a bit what I eat on a daily basis and truth be told, I try to follow a low carb diet. Eating salads– while delicious and healthy– can sometimes get boring which is why I’ve been coming up with cauliflower rice recipes. They’re super easy and fun to make and it really tricks my mind. As you guys know, I’m a rice & beans fanatic so anything that tricks my mind into eating a healthier rice without it actually being rice is a win for me. 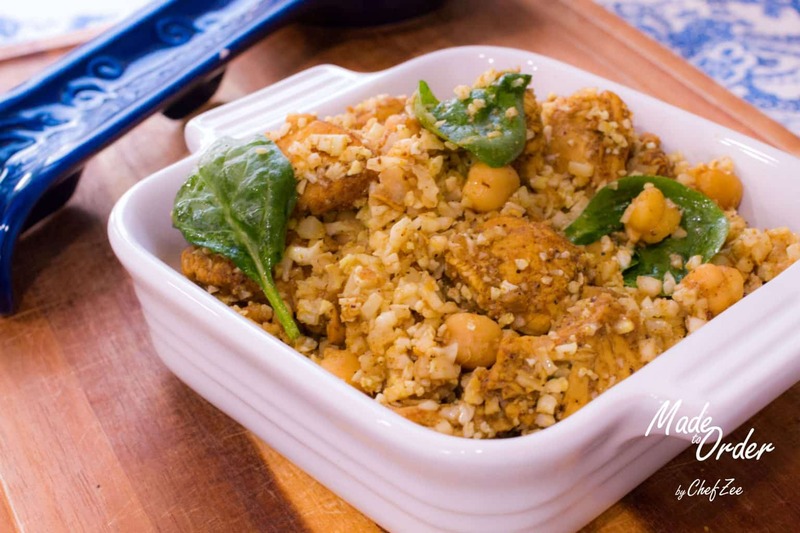 Curry Chicken Cauliflower Rice is an Trini Inspired dish that hits all the major flavor requirements. It’s bold, tasty, & satisfying. In fact, it’s a low-carb dish that I have ALL OF THE TIME because it doesn’t actually feel like a healthy dish. I can unapologetically eat the whole pot and know that I had a good serving of veggies! Woot woot, go me! If you’d like to learn How to Make Curry Chicken Cauliflower Rice, be sure to visit my YouTube Channel: Made To Order where I break down this recipe step-by-step. Let me know what’s your favorite healthy-low carb dish! Buen provecho. At the very end, add a few spinach leaves & enjoy! Cauliflower Rice cooks very quickly and you can cook it for as long or as little as you like. I personally like for my cauliflower rice to have a little bit of a bite, so I only cook it for about 3-5minutes. I also let the steam from the dish cook the spinach since I like for the spinach to also have a bit of a bite.